Microsoft has announced it is making a $300 million investment in Barnes & Noble's Nook digital-book business and college-texts unit. The move will give the software giant a 17.6% stake in a new subsidiary temporarily known as Newco, with B&N getting the remanning 82.4%, while all pending litigation related to Android will be put to rest. 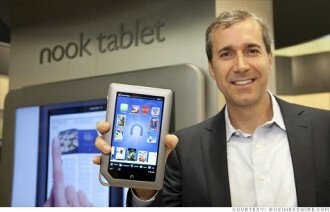 According to Associated Press, the deal gives Barnes & Noble ammunition to fend off shareholders who have agitated for a sale of the Nook e-book business or the whole company, in addition to appeasing concerns that it doesn't have the capital to compete in the e-book business with Amazon.com. Currently, Barnes & Noble relies on a customized version of Google's Android operating system for products such as the Nook Color and offers dedicated Nook reader apps for Android, iOS, OS X, and Windows. There's no indication that this arrangement will change following the deal, but Microsoft did say that one of the first orders of business will be a Metro-style Nook e-reader app for Windows 8 available to users globally. There was also no suggestion of what kind of Nook products the company might offer in the future or whether a Nook app for Windows Phone was in the works. In a conference call, William Lynch, CEO of Barnes & Noble, described Microsoft as the "ideal partner" for Barnes & Noble, pointing out their massive user base: "Microsoft's investment in Newco, and our exciting collaboration to bring world-class digital reading technologies and content to the Windows platform and its hundreds of millions of users, will allow us to significantly expand the business," Lynch said.